We're always talking about new gear, but that doesn't mean you can't create something beautiful with old gear. In fact, the older the better! A while back we saw Timur Civan pair a 5D Mark II with a 100-year-old lens, and it produced a technically poor but aesthetically pleasing image. There are times when the image doesn't need to be perfect, and we might want some wear in our image. Jason Bognacki has taken this a step further and has actually attached a Piccolette Contessa-Nettel folding camera from around 1926 to his Canon 5D Mark II. Thankfully he has graced us not only with photographs, but a video as well. It's always fun to see projects like this, because digital cameras are at a point where we can successfully take all of these old still lenses (or view cameras and lenses) and actually get great looking video out of them. It's not always about the gear, but about what aesthetic your particular gear can bring to a project. It's really a beautiful example of how you can achieve a vintage look without applying some fake filters in post. I'm always partial to doing as much in-camera as possible, so I'm always going to recommend using a vintage lens over a vintage filter. If you're interested in trying to build your own view camera lens attachment, Jason has provided some instructions on his blog. What's the Verdict on the Canon 5D Mark II Optical Anti-Aliasing Filter? It's not a view camera, it's a vest camera. 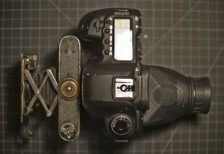 View camera shoots on plate film and focuses using a ground glass. I guess I'll be more specific, they just call it a folding camera but I was just using the title he used in his blog to describe it. I do understand what a view camera is, I've got hundreds of shots under my belt on one - in fact large format still has an edge over digital in my opinion from a resolution and depth standpoint - it's just extremely expensive. Ah, I didn't click through. Shame on him then, not you. Thanks for the article. Well in his article he calls it a folding camera, but what he calls this contraption is the 5D Mark II View Camera - so that's where the confusion came in and why I had written it that way originally. It's really my fault, so no worries. Hey Mike, check-this-out http://www.skgrimes.com/whats-new/2011-2/6706-2 A Canon with an old brass barrel lens. How Steam Punk is that? For certain things an uncoated lens is great. The internal flare acts as a fill light. S.K. Grimes can also make Waterhouse Stops for you barrel lenses without a diaphragm http://www.skgrimes.com/products/shifting-mounts Now you can shoot just like Gregg Toland ASC. thats a cool novelty kit but 350 is just insane. "It’s not always about the gear, but about what aesthetic your particular gear can bring to a project." Actually, it is never about the gear. k mr smartie pants. Take a picture without using a camera then. I'm really interested in using different lenses, especially old lenses with new cameras. I made a film using a 5d mark 2 and couple of my inherited vintage nikon primes at the weekend. Personally I prefer the aesthetic of these to the Canon L series lenses we use at work. I remember someone doing this a few years ago with a Canon GL2 pointing down into the viewfinder of a film SLR. It was mouthwatering, at the time. Last year's Bellflower used the SI-2K (which I think natively has that cold, sterile, HD, "video", gopro look) with a vast assortment of vintage lenses to great effect. There is a good article about it in American Cinematographer. It's funny films (being digital now) are doing what music did with the advent of the CD. The newer digital format was so cold and lifeless that people did all they could to "degrade" it and make feel alive again. The sampling of older recordings, the pops of record needles...this is sort of the same thing now with film.